Twisted paper cord woven across an open wood frame has been used to form the seats of Danish chairs since the 1940s but through the 1950s and 1960s paper cord became perhaps the most distinctive and, for some people, the type of seat most closely associated with chairs from the Danish Modern period … Hans Wegner used paper cord for many of his most important chairs including the Windsor-style Rocking Chair and the Chinese Chair - both designed in 1944 - the Peacock Chair from 1947; the Wishbone Chair that was produced by Carl Hansen & Son from 1950 and then for a series of remarkable chairs including the CH44 from 1965, with its thin seat and four thin slats across the back, in a style reminiscent of Shaker chairs, and the PP201 from 1969 that could hardly be more refined and elegant. Woven cane and even basket-like seats were used for several early, modern chairs and interlaced woven canvas webbing and even interlaced strips of leather were used for seats and backs in several chairs designed in the 1930s but as war engulfed Europe and, in this context, more important as war overtook the Far East it became more difficult and then impossible to source rattan or cane and merchant shipping was first disrupted and then soon became impossible for transporting anything but essential goods - not just in the Baltic and North Sea but around Africa and across the Indian Ocean. Several articles suggest that initially paper cord was developed in the war as an alternative to string for wrapping parcels … but, so far, I have found no references to indicate which Danish paper mills first produced paper cord or when production started and no reference to indicate who,- which designer or which furniture maker - first used paper cord on a chair as an alternative to cane. Paper cord used by Danish companies is twisted with three strands that form a cord 3.5 to 3.6mm thick … although this is usually expressed as 7 strands to an inch. It is generally unbleached - so a natural colour - although a number of chairs are produced with an option to have black cord or even white bleached paper cord. However, it is the natural light brown or dark cream colour that seems to work particularly well with oak but can also look striking when there is slightly more contrast with a darker wood for the chair frame such as walnut. Natural cord works well with wood that has been stained black but I'm not easily convinced that it works as well with white or with pale wood like ash or the colour of beech that tends to darken over time to a yellow. There are videos on the internet that take you through the process of weaving a seat for anyone wanting to restore a chair. Perhaps the most difficult part is to keep the tension right across the whole seat and to keep the lines of cord regular and straight, particularly the diagonal line running in to the centre when it is that pattern of weaving, and difficult to do it properly so the pattern remains even as the weaving settles into place. Generally, the cords running front to back seem tighter than the cords running in from each side. Apparently, most paper cord is lightly waxed so, to some extent, resists dirt and the web site for Carl Hansen has useful suggestions for how to clean and maintain paper cord. With care a good seat is said to last up to 60 years before it needs to be rewoven. 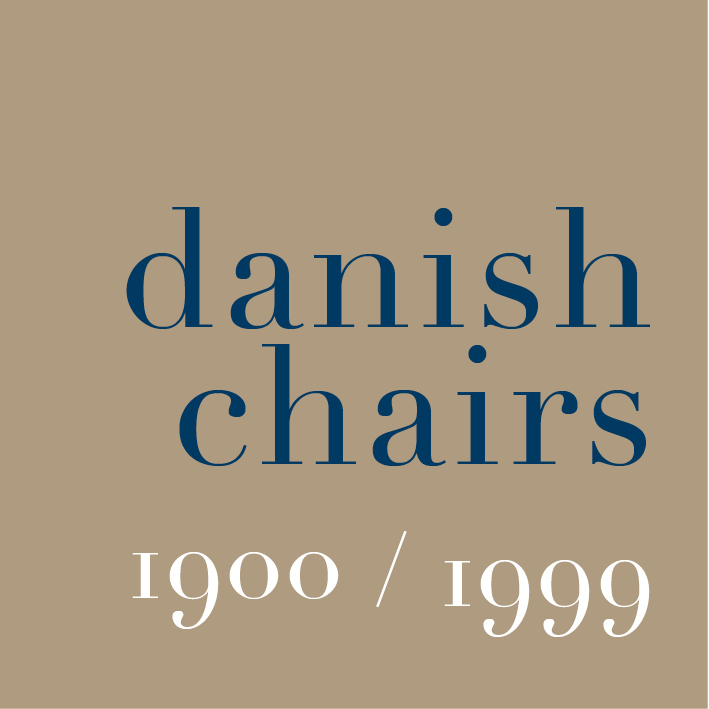 *Early examples are illustrated in Danske Bondemøbler by Axel Steenberg and the distinct arrangement of the seat rails found on many of the modern chairs with paper cord - with the side rails set higher than the front rail forming the hollow shape of the seat - can be seen on several of these earlier chairs. The use of paper cord developed with two basic patterns and, in terms of the form of the frame of the seat, these types were not interchangeable … generally a chair has to have an arrangement of the frame or the rails of the seat that is appropriate for the specific type of woven seat. The woven or basket form of seat is close to the techniques that had been developed for rattan or cane seats. Generally they have a single woven layer of cords across the top of the seat with cords running straight back from the front rail and then cords running across the seat going over and under and usually over pairs of cords rather than over and under every other cord. 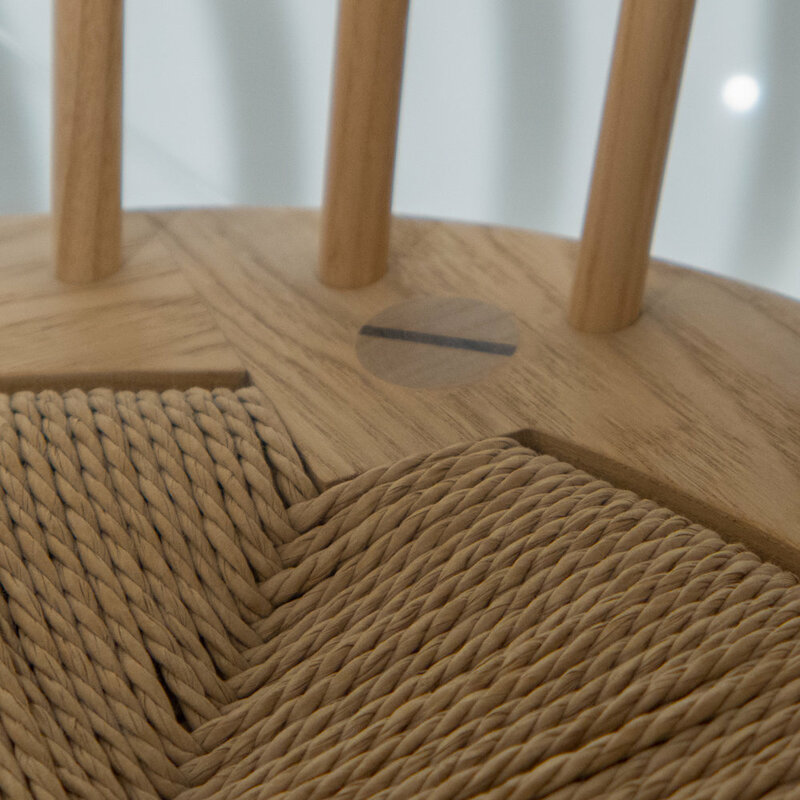 Spaces between paired cords are created by winding the cord several times around the seat frame before returning across the seat with the next line of weaving. As paper cord is softer, so not as fine or as tough as cane, the traditional cane pattern - with a grid and then with diagonal canes woven in and out across the seat to form an octagonal pattern - is not possible. Any pattern, above and beyond the basket weave, is restricted to leaving bands or gaps often with crossing over cords to form a pattern, with a series of X crosses, and generally that is kept to the edge of the seat. Paper cord is not appropriate for weaving through holes in the frame - a technique used with cane - in part because it is too thick and in part because turned at a sharp angle and then under stress with the weight of someone sitting down, the cord would sheer on the edge of the hole. Nor can cord be used successfully with a round seat … split cane has a flat back so tends to keep in position where it crosses over and round the seat rails but the round paper cord seems to slide or move slightly so many chairs have a rounding off or recess in the areas where the cord will pass around the rail that helps keep it in place and running back straight. The only way to keep the cord in position would be to use metal staples or bent over nails and with most cord seats these are kept to a minimum … on most chairs used just at te start to hold the end of the cord in place or where an awkward angle, for instance around a leg, would mean that cords could drop down or cut the angle of the corner if not held in place. The basket pattern seat is normally woven over quite deep front and back rails that on many chairs are curved down to create a more appropriate cushion shape … one chair in particular - the CH23 by Hans Wegner from 1951 - imitates closely the profile of the Red Chair with its deep front rail to the seat. 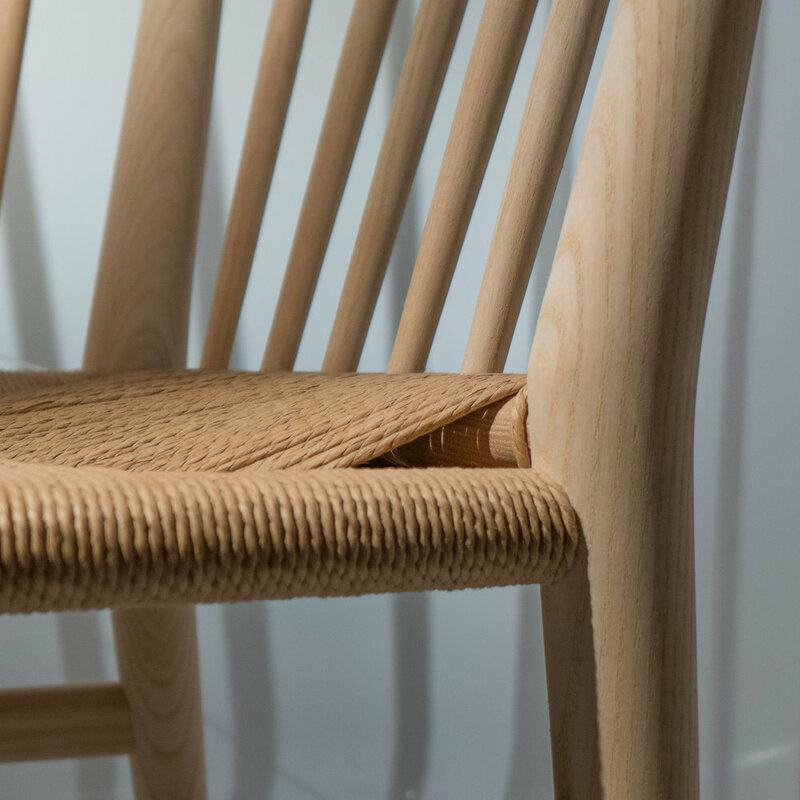 In the most straightforward form of chair, the seat rails are simply spindles, rather like the stretchers, or are slightly wider than they are high but even then little thicker than the stretchers. On the Wishbone Chair the seat is just 30mm thick including the seat frame and the cord passing across the top and back under. This is important because earlier rush seats or seats in twisted straw tended to be quite bulky and uneven so looked crude or rustic (fine in an old home in a country farmhouse or village cottage but not so appropriate in a Copenhagen apartment) but actually the paper cord seat - as developed by Wegner for a chair like the CH44 from 1965 - with its thin seat and four thin slats across the back in a style reminiscent of Shaker chairs or the PP201 from 1969 - could hardly be more refined and elegant. As paper cord was used on more and more sophisticated chairs there are more and more intriguing designs developed to take the paper down in front of or around rails or around back splats. This often meant taking the cord through slots in the frame rather than across and over the full section of a side rail. 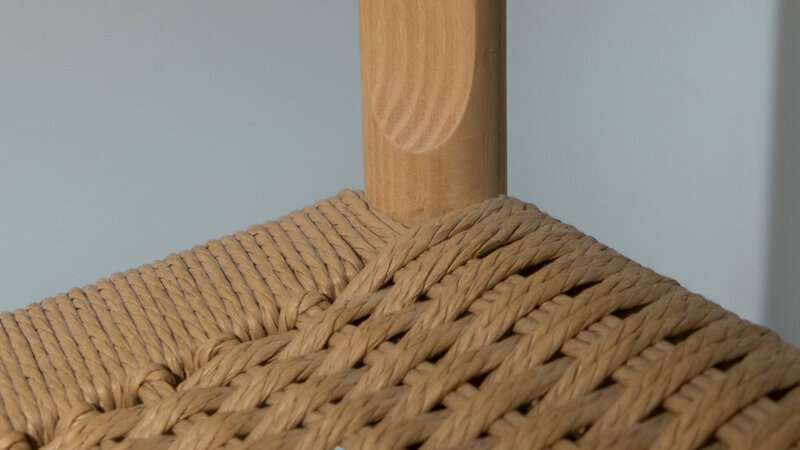 The second form of woven seat is the type where the cord is taken completely over the seat rail and returned across the underside so in appearance looks almost like a cord seat pad with little or none of the frame left exposed. The Peacock Chair has a robust frame but with the rails of the seat that are much wider than they are high so they are strong but still not bulky. In this chair the front, side and back rails of the seat are all at the same level with the turned legs driven through a hole towards each corner and held in place by splitting vertically down into the top of the leg with a wedge driven in from above. This is made into an attractive feature of the construction by being made with care and being left exposed so the cords of the seat are set in from the corners of the seat but the X-shaped pattern of the cords is the same as that on the Wishbone and later chairs. Seat rails are, at the very least, rounded on the inner edge to reduce wear but on several chairs the inner upper corner of the rail is taken down to form a chamfer or perhaps more accurately a slope that sets a hollow shape for the seat and, again, reduces the stress on the cord where a sharp angle might cause it to wear or break. Photographs of the paper cord seat of a Wishbone Chair are shown in a separate post.